That top image was my attempt at a Librarian using a technique I was developing a while back. It later turned into my Deathwing method, but I was trying to apply it to a dark blue model instead of light bone color. When I posted pics of him, nobody really knew what he was supposed to be. It was hard to tell what he represented on the table. I'm talking about those little things we all "know" as it relates to various armies in the 40k universe. We "know" Librarians are blue, we know Eldar have pointy heads, we know Tyranids have lots of arms and claws. They are stereotypical, but it's how we recognize things quickly and assign what we know about them just as fast. Let's look at this guy here. He's got blue armour and that should help identify him as a Librarian, but it doesn't. His robes cover up the majority of it. He's got a psychic hood, but that doesn't do the trick either. He doesn't read as a Librarian right off the bat because of the weapon he is holding. We know Librarians should have a long staff. We know Chaplains should have a shorter crozius. This weapon looks like a crozuis at first glance and our mind immediately sees him as a Chaplain. It doesn't matter that he has a psychic hood on or you can see his blue armour peeking out from under his robes... we've already made up our mind. If you don't believe me, try this quiz here. Well, as much as I hate to say it, we feed into the stereotype. Unless we want to constantly answer the question, "What is he?" We'll need make sure our Librarians have a suitable looking weapon and are dressed accordingly. Looking the part is important if you want others to recognize what you're setting down on the tabletop. Now that I say this, if you're doing an extensive "counts as" type army, this is not going to work. You'll end up explaining what things are as folks aren't going to recognize what anything is to begin with. My friend ending up sending the model back to me and asked me to "fix it" so he could continue to use it as a Librarian and not have to explain what model it was before every game. I decided to make some modifications to the model with his permission in order to bring it more in line with what people recognize or imagine when it comes to a Space Marine "Librarian." The first thing I did was order some new bits for him. He needed a longer staff and I wanted his other arm to look as though he were casting a spell as only Librarians can do. I ordered the bits I needed from Spikey Bits after talking to him about my project. Come to find out he's not too far away from me and he was able to get me the specific pieces I needed without it costing me a fortune. And here's the new model. You can see a tiny bit more of his blue armour, he's holding an iconic Librarian staff in one hand, he's casting a spell as only Librarians can do with his other hand... this guys fits the bill perfectly now. The new weapon looks like something a Librarian would be holding. The extended arm with no weapon and only a hand gesture is another iconic Librarian element. These two simple changes have made the model into something else. He no longer reads like a Chaplain, but looks like a truly powerful psyker now. I'm hoping my friend no longer has to answer the question before every game now and his opponents recognize what he's got on the table. I'm not sure what else I could do to it at this point if he sends it back again. Did I paint my HQ model wrong? LOVEEEE the way you reworked that Librarian. A very interesting article as well, but what holds my attention is that staff. Amazing job with that. I totally agree. Those changes are a 100% improvement on that model that just work perfectly. 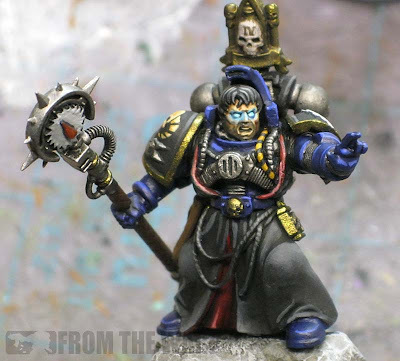 I'm a huge fan of the Terminator Librarian model but in my opinion it only works with the spell casting hand and not the storm bolter or combi weapon . Having said that I've done totally the opposite and done my apothecary black to make him stand out from the white pre-heresy death guard. 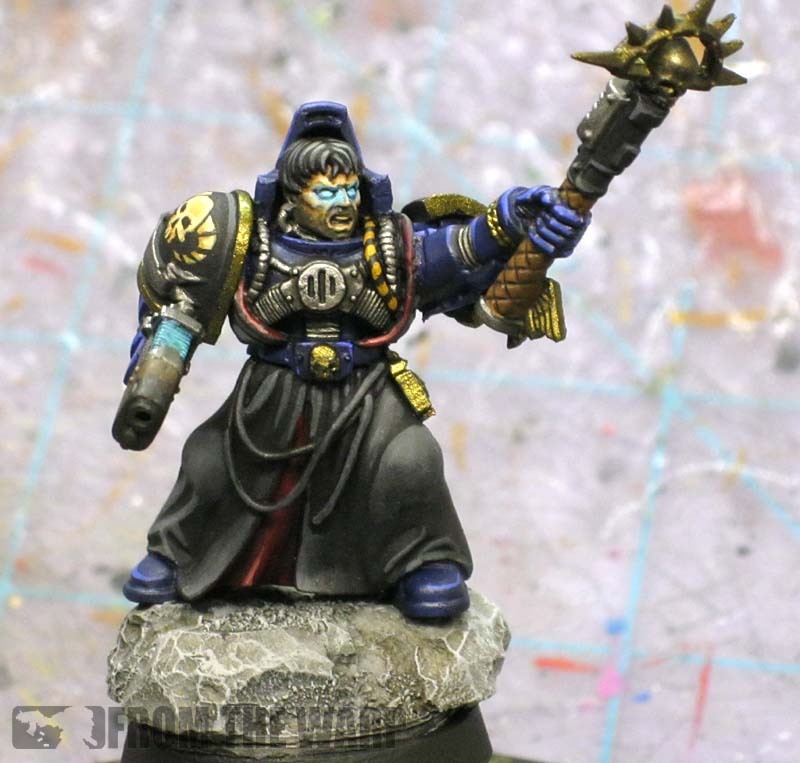 I think when it comes to certain models it depends what the main colour of the army is.If I was doing an ultramarine army for example I think I'd be looking for an alternative to blue for my librarian to get some contrast. 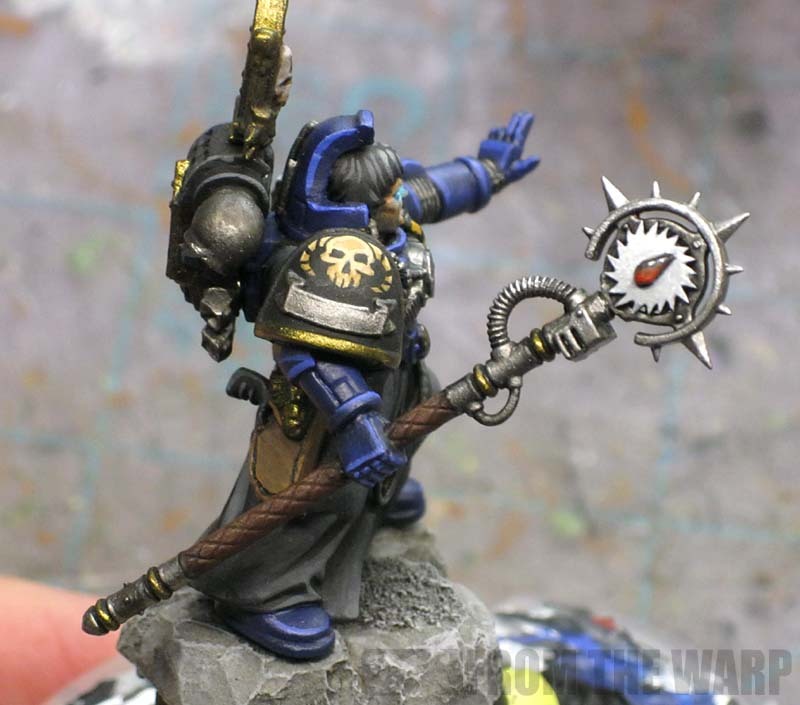 I've always had an issue with Librarians that the deep blue they use for them often makes them look like Ultramarines that wandered into the wrong battleforce. when i took a stab at my own Libby i tried to go for a more grey-blue washed out colour inspired by the model used in the Dawn of War 2 game for Jonah Orion. It still very recognisably "Librarian" but not as vibrantly coloured. whilst no-where near Ron's standard he's here: http://tinymens.blogspot.co.uk/2012/01/blood-ravens-librarian-completed.html although the pictures are "bluer" than the real life model. Interesting article Ron, it really makes you think. How would you go about applying the stereotypes you've outlined here to a hero model who is a psyker? I'm planning on building a model based on Zahariel from the Dark Angel books in the Horus Heresy series. I was going to give him black armour to match the pre-heresy vibe and give him a force sword. Do you think that would still work as a Librarian or no? 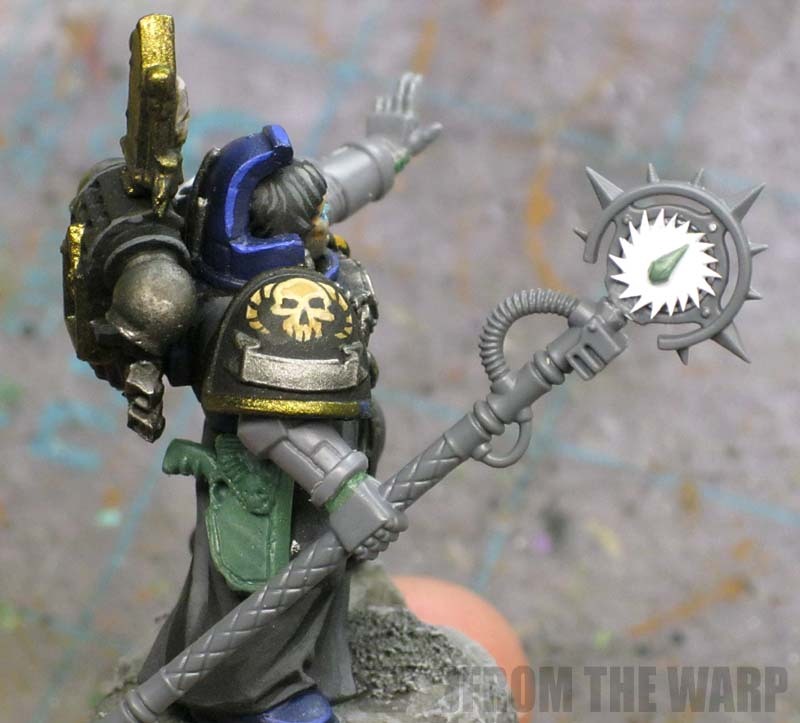 I can't wait try to work some of these ideas into my white scars army, (currently my storm seer looks much like an angry space wolf with a plasma pistol). 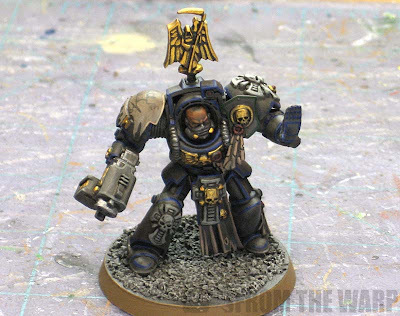 Question Ron, is the staff arm the one from the grey knights? The warding staff arm? I'm painting a flesh tearer army currently and I'm thinking of kit bashing a librian together, and i love this guy!! On a side note here is my blog for my armys minaturemadnesss.blogspot.com any help would be appricated!! For some reason my new camera picked up a yellow tinge to the pictures odd since I am using a nikon JL1 slr and a daylight bulb in my lamp. As aomeone who teaches character design to his students i must say you've nailed something here we often talk about, and its something the games industry (PnP and Computer) uses very frequently. Theres a whole range of character arechtypes that we understand through years of familiarity whith the genre and media we consume, in the 40k sphere "Librarian" is a very good example of that, as it's a character archetype that spans many different chapters and is associated with different trappings, adornments and paint schemes, but the few core identifiers that keep the "read" of a figure as "Librarian" and not something else, you've clearly picked out. Even if one looks at the Rune Preist.. probarbly the farthest you can get from the "Librarian" trope and still hope it reads as one, we see that the sucessful Rune Preist models have the right marker you identify, glowy eyes, aegis hood, staff, "casting" pose, and indeed blue armour. Ok, I'm the friend Ron is talking about ... this is my model and let me tell you it works PERFECTLY now as the Librarian in my army. (Thank you Ron!!!) The first time around I had picked out that shorter weapon and in my own mind it seemed fine. Not until I started seeing other people's reaction did I realize my mistake. It's really made me step back and resonsider my conversions and how they are interpreted. To be fair to both Ron's Friend and Ron, the original model was immediately recognizable to me as a Librarian, because of the Hood, cabling, the Glowing Eyes and the Robed, Blue Armor. To be fair the the folks who didn't get it, the short Force Weapon did give me a second's pause. To be fair to the new revision to the model, I LOVE the changes. I liked the original just fine, but the alterations made put the figure over the top. Great article, Ron - the re-worked Flesh Tearer Librarian looks spectacular, definitely more immediately recognizable. Really the only thing about the old model that was jarring was the weapon, it just looked too much like a Crozius, which caused a bit of cognitive disconnect looking at the model. Amazing work Ron, just an awesome use of bits and details. I have to agree with you, we assume what models are when we look at the table. The model you have right from the start, the icon is awesome looking, how did you do that? You don't even have to put a badge on a Librarian model. Then you can use him for every army. Who is going to notice one model out of 50 does not have a badge. @Mordian7th - looks like the scout sergent hand from the scout sniper box? The new arms are not only more librarian-y, I think they also capture a much better sense of dynamism with a better composition. Good work! On a bit of a side note, the model and pose signify more for me. Then I realised that I missed the blue librarian thing by starting with Rogue Trader and being a poor student. We were still playing a rogue trader/2nd ed mix in 2000, using RT armylists and some stuff from GURPS thrown in to change the turn and action structure, but no new resoure books. (Some research tells me 1995 with the 2nd ed ultramarines codex is where it all began.) Thanks for finally making me find that out! First of all, great librarian! Secondly, although personally I stick to the stereotypes if someone wants to play with a yellow librarian good luck to them, the hobby is yours to interperate it as you will. The "rule of cool" backs this up I think. As always, keep up the excellent work Ron! Holy cow, thanks for all the comments guys! dancing platypuss: You bring up a good point. Keep the stereotype or start with it at least and then move away slightly until you have something unique but still recognizable for what it is. An excellent way to get some variety and make your force stand out while still being easily identified. Damn The Valley: Thanks. The staff (or the icon on it) was actually a last minute idea I came up with to make him more chapter oriented. Good thing it worked out. Andy: Nice work. But I can see you've got that Apothecary bit in white and it's easily seen. The black armour makes him stand out , but that bit is what people use to identify the model. Nice job on him. Matt Farr: I remember your Librarian now. The slightly washed out blue can be a nice change from the pure colors we often see. You've still got the blue, you've still got the weapon and the pose... you're just pushing it a little bit like dancing platypuss was talking about doing. Dugatron: That's a good question. 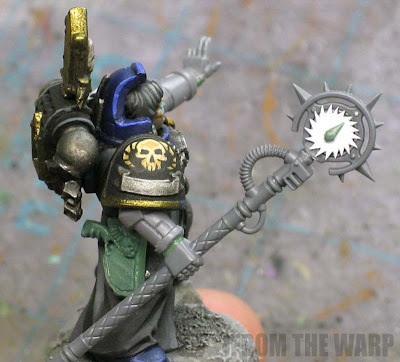 I think I'd look at what iconic elements there were for that model and then combine them with the elements of their chapter (in the case of marines). When it comes to picking obscure characters, you might not be a hit with every viewer, but if you can hit the mark with the folks who have read the book or know the story, I'd call that a success. I'd have to read up on Zahariel to see what jumped out at me. I might still find a way to incorporate some minor blue parts just as a reference for viewers. EllisW: Yes, the one with the skull in the middle. I forget if it's the one for terminators or power armoured marines... but it's from the GK bits. Karitas: Thanks. You're right about the Wolves too. They have stripped it down to a few "key" elements and those carry the model. Muskie: Nice models. Chaos opens up a whole new realm of possibilities when it comes to psyker models as the constraints aren't as tight. Mordian7th: Bryan was right, it's the Scout hand. I liked the position and it was not the regular devastator hand you normally see there. Fayte: The staff was used as is except for the Tearer icon obviously. I cut out the skull from the center and glued two plasticard saw blades in place of it (one on each side). I made them just big enough to touch the outer circle so they were supported. The blood drop is greenstuff. Gorman: The added dynamic to the pose was an added bonus. I hadn't planned for them to do that, but it was a nice addition. I'm just glad the new arms worked as well as they did with the torso. ieuan: Thanks. And yes, I would always tell folks to paint/model how they want. Once folks know the tricks to making things easily recognized for what they are... they can use that accordingly on their models to make them stand out or hide them if the need was there. "The new weapon looks like something a Librarian would be holding." The new weapon looks totally awesome too. It's simply great. Anon: Thanks! The weapon or the look of the weapon plays a big part in the overall model. i gotta say, i love the redux. but i saw nothing wrong with the 1st incarnation. cpt codpiece: Thanks. In the end, it was about making him look the part just as much as it was coming up with a cool conversion. If for nothing else than to get rid of the headache of explaining his purpose every game. And I love the sword on your conversion there. He's got a great pose too.